Teresa Garcias runs a small grocery store (a miscellaneous store) in Nogales, Mexico. She buys products in bulk and sells them in her neighborhood. She has been living in Nogales for 19 years and started working with ProMex Group in 2006. Her current loan is for US$1,000. She was selling products out of her home but recently started renting a store but has determined (with the help of ProMex Group) that she does not have enough sales to make it worth the rental cost. She will move back to selling from her home soon. Her business and sales have grown since working with ProMex Group and she is able to afford better food and clothing for her kids. She has a husband and two kids. 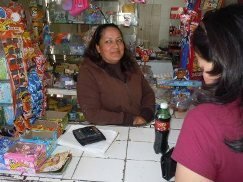 If you support creating economic opportunities along the Mexican border (in Mexico), consider supporting ProMex Group (charitable microfinance for the Mexican border). You can Donate, Lend, Donate items, allow us to Speak and Visit the project. Please contact us for more information.